This banner shows you the famous ‘De Nachtwacht’. This masterpiece was painted in 1642 by Rembrandt van Rijn. The painting is now displayed in the Rijksmuseum. ‘De Nachtwacht’, which means ‘The Night Watch’, is one of the most famous paintings from the Dutch Golden Age. 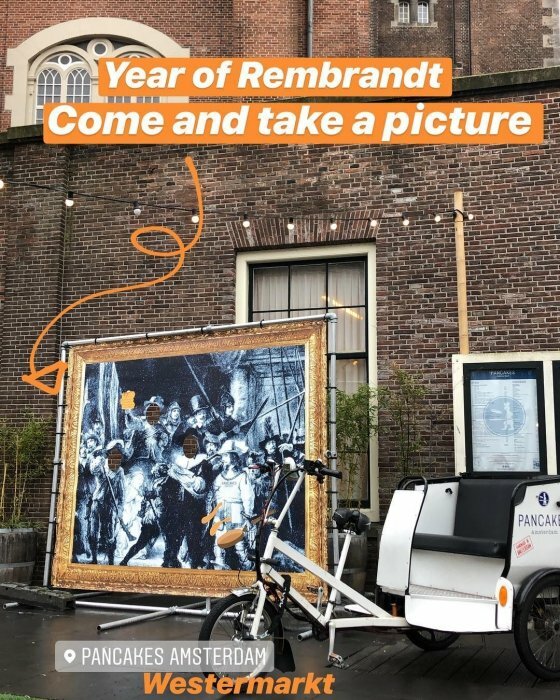 This year, we are celebrating the immortality of Rembrandt. As an innovative master painter, Rembrandt van Rijn is one of the most beloved artists the Netherlands has ever known. He is also counted among the world’s best and most famous artists. This year, it’s been 350 years since Rembrandt died. His life and legacy will be celebrated with exhibitions throughout the Netherlands in 2019. Rembrandt died in 1669 and was buried in Amsterdam’s Westerkerk. But do you know where exactly? What is the location of the resting place of Rembrandt van Rijn?